This chapter describes a typical method for calibration of glass electrode pH meters. In calibration, the zero point and sensitivity (span point) of the pH meter are accurately adjusted using a pH standard solution. Nowadays, most of the operations explained here are performed automatically. Since some operations are unique to the pH meter, they must be performed in accordance with the instructions given in the operation manual provided. Attach the necessary sensor (electrodes etc.) to the pH meter main unit, then turn the main unit on. Prior to measurement, wash the sensor with pure water three times or more, and wipe it with clean, soft paper (such as tissue paper). Put some neutral phosphate standard solution (pH 6.86 at 25°C) into a beaker, and insert the detecting element into the solution. Adjust the temperature compensation dial of the pH meter main unit to the temperature of the neutral phosphate standard solution. In many of the latest pH meters, this operation is completed automatically simply by pressing a button. Use the adjustment dial of the pH meter main unit to set its scale to the pH value corresponding to the temperature of the neutral phosphate standard solution (pH 6.86 at 25°C). In many of the latest pH meters, this operation is also completed automatically simply by pressing a button. Formerly, the adjustment dial was known as the zero-adjustment dial (asymmetric potential difference adjustment dial). 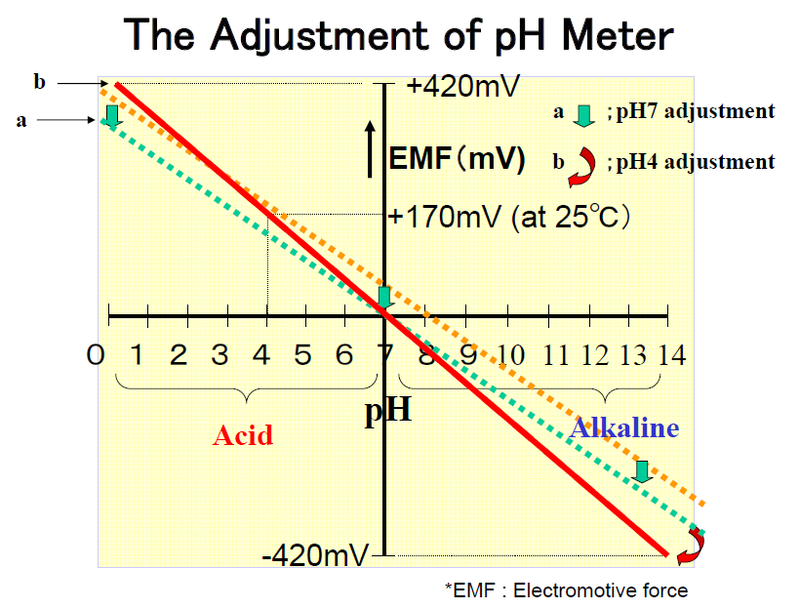 ● This operation corresponds to the correction for region “a” (zero-point adjustment) shown in the attached schematic diagram, which outlines zero-span calibration of the pH meter. Take the detecting element out of the neutral phosphate standard solution, wash it with pure water three times or more, and wipe it with clean, soft paper. When the pH of the sample is expected to be acidic (pH 7 or lower), put some phthalate standard solution (pH 4.01 at 25°C) or oxalate standard solution (pH 1.68 at 25°C) into a beaker, and insert the detecting element into the solution. Use the span adjustment dial to set the scale of the main unit to the pH value corresponding to the temperature of the standard solution (phthalate standard solution: pH 4.01 at 25°C; oxalate standard solution: pH 1.68 at 25°C). When the pH of the sample is expected to be alkaline (pH 7 or higher), use borate standard solution (pH 9.18 at 25°C) or carbonate standard solution (pH 10.02 at 25°C) and perform the same operation to set the scale of the main unit to the pH value corresponding to the temperature of the standard solution. In many of the latest pH meters, these operations are also completed automatically by pressing a button. ● This operation corresponds to the correction for region “b” (span adjustment) shown in the attached schematic diagram, which outlines zero-span calibration of the pH meter. Repeat operations 2) to 5) until the indicated pH value agrees to within ±pH 0.05* with the pH corresponding to the temperature of the pH standard solution. * These operations must be repeated until the indicated pH value agrees with the pH corresponding to the temperature of the pH standard solution to within ±pH 0.02 for type I pH meters and ±pH 0.1 for type III pH meters.